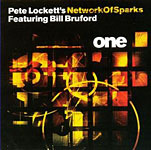 Released in 1999 on the obscure Melt 2000 label, Bill Bruford's reissue of fellow percussionist Pete Lockett's One continues the now retired drum legend's campaign to release and/or reissue works focusing on the clearly infinite rhythmic, melodic and textural potentials of all-percussion ensembles. One follows the World Drummers Ensemble's world-centric A Coat of Many Colors (Summerfold, 2006) and New Percussion Group of Amsterdam's near-classical Go Between (Summerfold, 2007), which reissued a 1987 EG Records date. For fans of Bruford 's art rock work with Yes and King Crimson, or later jazz proclivities with his evolving Earthworks band and Dutch pianist Michiel Borstlap, Onelike the other two percussion releaseswill come as no small surprise. That's not to say that Bruford's instantly recognizable toneand remarkable ability to mathematically subdivide and regroup rhythmic modules into weird and wonderful groovesisn't intact. But this is Lockett's datea master percussionist with an international reputationand Bruford only plays on half of this one-hour set's ten tunes. Still, there's little denying Bruford's impactnot just on the tracks on which he plays, but over the album's entire arc. Bruford's tribal opener, "Conundrum," first surfaced in '90s-era King Crimson shows but was, in fact, originally written as a duet for Lockett's frame drums and Bruford's "gong drums." Expanding to include Simon Limbrick and Nana Tsiboe, Bruford's arrangement of jazz legend (and major influence) Max Roach's "Self Portait," also heard on A Coat of Many Colors, receives a subtler but equally propulsive treatment, with Bruford's kit placed in a culturally expansive quartet featuring djembe, dumbek and darabuka. Bruford, Lockett and Tsiboe also take a look at Swiss percussionist Pierre Favr's "Prism," from Singing Drums (ECM, 1984)a tremendously influential album amongst percussion ensembles. Structure abounds, but there's also room for personal interpretation here, as kit meets conga meets cowbell meets tamborim. The rest of the setwritten by Lockett alone or in collaboration with members of Network of Sparksis equally engaging. Tuned percussion creates melodic appeal on the Africa-centric "Travel Light," even as a confluence of repeated interlocking patterns engenders shifts in emphasis. With Limbrick's vibes, keyboardist Pam Chowhun and Lockett's use of samplesin addition to a myriad of hand percussion instrumentsthe gamelan-informed "Complex Transactions" may be an appropriate title, but its soft groove and ethereal tone recall the late Pierre Moerlen's Gong, albeit less weighty and with reduced electricity. The repeating two chords of "Full On II," on the other hand, draw an even more muscular link, while "Lumina," co-written by Lockett and Limbrick, completes a perhaps unintended homage triptych; more atmospheric, its near-ambience uses sonic treatments to build a delicate, gossamer-like tone poem. Whether driven by pulse, melody or texture, One's global breadth of influence makes it a percussion tour de force that proves percussion ensembles needn't appeal only to percussionists and drummers. Track Listing: Conundrum; Travel Light; Self Portrait; Voices Apart; Complex Transactions; Groove Oddity; Lumina; Irreversible Blue; Prism; Full On II. Personnel: Pete Lockett: Japanese drums (1), tablas (2, 6, 10), talking drum (2), vibraphone (2), dumbek (3), brush (3), frame drum (4), tar (4), konnakol (4), shakers (4, 6, 8, 10), customized floor drum (5), drum set (5), cymbals (5), bongos (5, 6, 9, 10), belts (5), Egyptian tabla (5), sound treatments (5-8), S5000 sampler (5, 6, 8), UDU (5), manjira (5), bowed cymbals (6), chappa (6), percussion (7), effects (7), chair (7), kanjira (8), elephant bell (8), cowbells (9), floor tom (9), tamborim (9), bells (10), samplers (10), quinto (10); Bill Bruford: gong drums (1), drum set (3, 6, 9, 10); Simon Limbrick: marimba (2, 10), darabuka (3), vibes (5, 7), gongs (7), bass drum (7); Nana Tsiboe: djembe (3), congas (9, 10); Pam Chowhan: keyboards (5); Johnny Kalsi: dhol (10).